...while there may be bigger Big Data experts out there, I humbly offer the following concisely-defined terminology as an entry-level base for Big Data. We begin with the white whale itself. There are all sorts of popular and academic articles available defining Big Data, and the definitions vary considerably. In the interest of capturing the term's essence, we like this definition: "Data is big when data size becomes part of the problem." Big Data is a moving target, and this definition provides the flexibility required to capture its central characteristic. Big Data is often characterized by the (originally) 3 Vs, which has grown to 4, 5, 6, or more, depending on where you look. I believe the following 6 Vs are enough to explain Big Data at a very high level. Volume refers to the quantity of generated and stored data. The size of the data determines the value and potential insight, and whether it can actually be considered big data or not. Velocity is the speed at which the data is generated and processed to meet the demands and challenges that lie in the path of growth and development. Variety refers to the type and nature of the data. This helps people who analyze it to effectively use the resulting insight. Veracity is the quality of captured data, which can vary greatly, affecting accurate analysis. Variability is the inconsistency of the data set, which can hamper processes to handle and manage it. Value is tossed around as an important Big Data V from time to time, and I agree with its consideration, especially from a business standpoint. Value refers to what insight can be leveraged from the patterns, processing, and other Big Data-related tasks on the data in question. 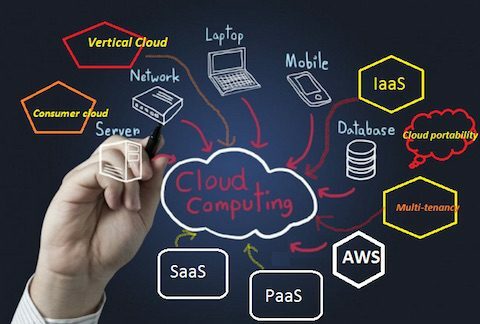 Cloud computing, or what is simply referred to as the cloud, can be defined as an Internet-based computing model that largely offers on-demand access to computing resources. These resources comprise of many things, such as application software, computing resources, servers and data centers etc. Cloud service providers usually adopt a ‘pay-as-you-go’ model, something that allows companies to scale their costs as per need. It allows businesses to bypass infrastructural setup costs, which was inevitable prior to the advent of the cloud. Technology that learns from experience (data) to predict the future behavior of individuals in order to drive better decisions. A mechanism that predicts a behavior of an individual, such as click, buy, lie, or die. It takes characteristics (variables) of the individual as input and provides a predictive score as output. The higher the score, the more likely it is that the individual will exhibit the predicted behavior. This form of analytics is descriptive in nature, as its name clearly hints at. Descriptive analytics summarizes data, focusing less on the precise details of every piece of data, and instead focusing on an overall narrative. Prescriptive analytics generally follows prediction, in that actions can be prescribed based on what has been gleaned from predictive modeling. A data warehouse is a subject-oriented, integrated, time-variant and non-volatile collection of data in support of management's decision making process. ETL stands for Extract, Transform and Load. This is the process of extracting data from source systems, such as transactional databases, and placing it into data warehouses. If you are familiar with online transactional processing (OLTP) and online analytical processing (OLAP), ETL can be thought of as the bridge between these 2 system types. And perhaps the most ambiguous term of all (an incredible feat in a set of Big Data terminology definitions) is business intelligence (BI). BI is an unstable, ill-defined set of tools, technologies, and concepts which support business by providing historical, current, and predictive views on its operations. The relationship between BI and data mining, in particular, is a curious one, with various definitions proposing that: BI is a subset of data mining; data mining is a subset of BI, BI is driven by data mining; BI and data mining are separate and mutually exclusive. So, that settles that. In the age of data science and Big Data, BI is generally thought to include OLAP, competitive intelligence, benchmarking, reporting, and other business management approaches (all of which tend toward ambiguity in definition as well), and is heavily influenced by the dashboard culture. Apache's Hadoop could almost single-handedly be responsible for the rise of the Big Data Revolution, at least from a software point of view. Apache Hadoop is an open-source framework for processing large volume of data in a clustered environment. It uses simple MapReduce programming model for reliable, scalable and distributed computing. The storage and computation both are distributed in this framework. Apache Spark is a powerful open-source processing engine built around speed, ease of use, and sophisticated analytics, with APIs in Java, Scala, Python, R, and SQL. Spark runs programs up to 100x faster than Apache Hadoop MapReduce in memory, or 10x faster on disk. It can be used to build data applications as a library, or to perform ad-hoc data analysis interactively. Spark powers a stack of libraries including SQL, DataFrames, and Datasets, MLlib for machine learning, GraphX for graph processing, and Spark Streaming. You can combine these libraries seamlessly in the same application. As well, Spark runs on a laptop, Apache Hadoop, Apache Mesos, standalone, or in the cloud. It can access diverse data sources including HDFS, Apache Cassandra, Apache HBase, and S3. The concept to allow internet based communications to happen between physical objects, sensors, and controllers. Machine learning can be employed for predictive analysis and pattern recognition in Big Data. According to Mitchell, machine learning is "concerned with the question of how to construct computer programs that automatically improve with experience." Machine learning is interdisciplinary in nature, and employs techniques from the fields of computer science, statistics, and artificial intelligence, among others. The main artefacts of machine learning research are algorithms which facilitate this automatic improvement from experience, algorithms which can be applied in such diverse fields as computer vision, artificial intelligence, and data mining. Fayyad, Piatetsky-Shapiro & Smyth define data mining as "the application of specific algorithms for extracting patterns from data." This demonstrates that, in data mining, the emphasis is on the application of algorithms, as opposed to on the algorithms themselves. We can define the relationship between machine learning and data mining as follows: data mining is a process, during which machine learning algorithms are utilized as tools to extract potentially-valuable patterns held within datasets.